This is the recording of my show “Success With Srini” aired Live on Bolly 92.3FM on Saturday Jan 13,2019. You don’t need a life coach, in fact nobody does. People don’t wake up in the morning looking to hire life coaches to solve their problems. We don’t need life coaches but we need coaching. People shouldn’t hire you for what you can do.. but they should instead for who you are. That’s when you make big money. Srini Saripalli: There’re aspects of life, there’re aspects of our existence within which I come in and say, “Listen, I can do a few things for you. I can probably do a few things, or that thing that you’re already doing, maybe add a little bit of my insights and my experiences to it. That’s all. We are not looking for a life coach, we are looking for some coaching.” My name is Srini Saripalli, thank you for tuning in. The best way to reach me is via my email info@positivepositioning.com, that’s the email address. In the show you will not hear me, here you go to my website, they call me in my office, let’s get on a consultation. Any of those things. I dedicate my time here with you, for you. In fact here is my mindset as I come into to do the show. I believe, this is my thought, that everybody who listens to this show is already a winner. Everybody who is listening to this show at this point in time, this is live by the way, you are amazing. You are doing some great things. Srini Saripalli: There are some challenges, there are some roadblocks along the way. By the way, each one of us have those things. We all have challenges. We all have road blocks. My idea is that you are already a winner. You’re already successful in doing what you do and that you are looking for modifications in your game, that you’re looking for some changes. You’re looking to modify a few things in your game and maybe that this talk, maybe this conversation will help you, that’s my idea. You’re best game can be improved no matter who you are, or what you do. Your best game can be improved and your best act can be accelerated. People ask me this question. “Can I become successful? I’m working so hard, all these years I’m putting all this effort. Nothing is happening. Somehow I’m not feeling that I’m successful. Srini Saripalli: The truth of the matter is nobody can make you successful. You can listen to a success talk like this, you can read books, you can go to YouTube, you can watch videos. You can go to the best teachers in the world, the best philosophers, the best guides, they can’t make you successful. There’s no way you can be made successful, nobody can. Try this, get into this mood where, “I want to become successful in the next six months.” Try to accelerate success. Now, here is how you can accelerate success. By improving the game that you’re playing, by accelerating the act. That which you want to do five days from now, 10 days from now, today is the day. Do it now. Accelerate the act. Srini Saripalli: You see that the problem is this, you got to become intentional in what you’re doing today. Not intent, intentional, the activity. You want to make $1 million? You become intentional about it. You want to get that new job in that new company? You got to become intentional about it. Intent, everybody has, very few are intentional in what they’re trying to do. If nothing else from the show today, this is it. You got to become intentional in whatever … You have a small job, you have a big job, you have a small business, a big business. You have small investments or big investments. Anything you have got going, got to be intentional. You want to scale? You have to become an intentional. You want to go? You have to become intentional. I don’t want people to hire me for what I can do for them, I want people to hire me because of who I am. It’s not about writing your professionalism, it’s your life resume. You see that? Srini Saripalli: My name is Srini Saripalli, thank you for tuning in. The number in the studio, should we give this out Aaron right now? Maybe? No, okay. In just a moment, a few moments from now, we’ll open the lines in the studio. Here’s what I’m doing. I’m doing a live event on March 9th, which is about a month and a half, maybe a month and three weeks from now. I’m doing a live event, a one day event on success, personal development, business development, business growth, family growth. I’m inviting a bunch of my friends who are mentors, who are amazing in what they do. So they’re all coming in. This is a one day live event on personal, professional and financial success. That’s happening on March the 9th and what we will do … I just started talking about it last week. We don’t have anything yet. We don’t have a location, all the logistics are being planned out right now. Srini Saripalli: But then if you want to come to that event, as a success minded individual, you’re listening to this show early in the morning and I want to give out a couple of tickets to you, a couple of passes to a lucky winner today who calls in to the show. We want to create some momentum. We want to create some excitement. That’s the purpose behind this, and if you are one of the people who calls in, I’ll take your name. Aaron is going to help me pull a name out from that, and we’re going to give out two tickets to that individual. If you the winner, you get two tickets to come to Success 2019. It’s happening on March the 9th, is a Saturday, all day. All the logistics, all the details, all that thing will be figured out later. But here mark your calendar. Don’t ask where it’s happening? What’s the cost? Can I go? Can I show up? No, those things are secondary. What is important is, if you believe that you need some motivation, you need some inspiration. You want to align yourself, you have skills and capabilities and you want some pathway. You’re looking for a road or a pathway to open up for yourself. Srini Saripalli: By the way, I get this question all the time and I keep saying this in my seminars, “There is nothing new to be learned.” Yeah, you can take classes, you can learn, there’s a lot of things. But then majority of our good learnings happen when we unlearn the things that we already have. Our convictions, our beliefs that align in a certain way, that are limiting us from achieving what we want to achieve. We unlearn those convictions, and those limitations, we build a life. That’s the purpose behind any good mentorship or any good training. Your mentor doesn’t know a lot of things, your mentor is not living your life. But then your mentor, he or she, will undo some of your beliefs and convictions that are limiting you from achieving what you want to achieve. That’s what this event is all about. If you come, you unlearn. In the process of unlearning, you’re learning. Srini Saripalli: People come, “Hey, what do I learn? Is there a technique? Can I to take a note? Of course there are techniques, of course you can take notes and all but listen, majority of the results in life are not tangible, there’re intangibles. Majority of the results in life there are not tangible, but you’ve got to learn how to live in the solution. Most people wake up in the morning and they live with their problem. What should I do with my immigration? What should I do with my finances? What should I do with my job and I have this [inaudible 00:09:03]. I have to work through the weekend, through the long weekend to get this done right. Most are problems, but then, “Hey, I had this problem in the past. I found a solution for this. This is a similar problem. What can I do to take those lessons or those learnings from the previous time that I had this challenge? I’m going to bring that solution. I’m going to make that solution now work for this problem. Maybe I want to modify a few things. Srini Saripalli: If you constantly put, consistently put your mind in a solution mindset, problems seem to diminish. But here’s the truth of life, the more existence we have, the most problems we have. There is no individual that I know in an alive state who doesn’t have problems. In fact just moments ago, a baby who’s born has problems. Just a few moments away from saying goodbye to this life, an individual has a problem. In between every possibility, every thing has problems. A question I get is now, “How do I know that that which I’m working on is producing results? How do I know that which I’m doing is really adding up itself up?” Eventually all this will add up. “Srini, how do I know this?” We don’t know, nobody knows. If somebody says they know, they probably are not true. In fact, the beauty of life is, nobody knows what’s going to happen tomorrow, but that’s the truth. Srini Saripalli: What’s the idea of engaging like this? See, it’s all about producing results. You do what you do today, is you produce ourselves. I consult in companies now and yesterday I was asked a question by an individual. He asked me, “Srini, how is your day going?” I said, “Not good so far.” In a good way I said, “Not good.” “Why is that? You are always so positive, you are always so … “Listen, I’m positive. I’m a positive minded, I’m a compulsive optimist. I’m optimistic too. But here’s the deal, I’m pragmatic too.” So don’t get carried away by this whole positivity thing. You got to be pragmatic. You need to be a realist in how you’re dealing with life. 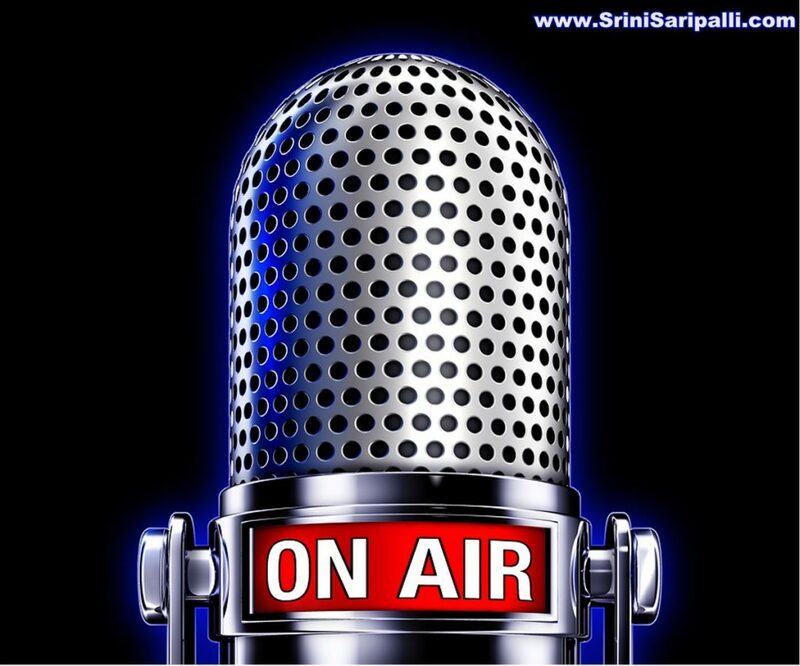 Srini Saripalli: My name is Srini Saripalli, thank you for tuning in. Thank you for listening in. This is Success with Srini, a show on human design, human engineering, human excellence. My idea is to come here to motivate you, to inspire you every Saturday morning between 9:00 AM and 9:30 AM. Okay, the number in the studio is 408 912 5038. Aaron is saying nobody start in such an inspiring way. Okay, I take it. Okay, no worries. Okay, 408 912 5038. If you want to come and join Success 2019, it’s happening on the March the 9th, a one day event on life, business, relationships, finances. You want to come join that event, it’s not about my event. I’m just the guy who’s putting this together. I’ve invited a bunch of my friends to come in to speak, to inspire, to motivate, to give you some ideas, some parts, some strategies, some techniques so that you can go build your 2019. In fact, it’s named 2019, but it’s not about 2019. It’s about everything beyond from this point. Srini Saripalli: This event has been happening for several years. In fact, we didn’t do that in 2017, but I have been consistently doing this event. There’s a lot of people who got benefited from this event. I’m bringing back this event, the second sense of enthusiasm, sense of excitement, and I want you to be part of this. If you want to participate, give a call into the studio right now and I’m going to take your name into a draw and at the end of the show we’re going to announce the winner and if you are the winner, you get two tickets to come to Success 2019. Okay, 408 912 5038 is the number in the studio. You want to come. If you want to come, that’s a one day event, it’s going to happen and it’s all about you, your success and all that. You’re learning, you’re unlearning as you’re going through that. Srini Saripalli: But then if you want to come and spend two weeks with me, then I have an expedition I’m leading to the base camp of Mount Everest. It’s happening in March again, I think end of March, I believe. We don’t know the date yet, so for that one too, but sometime end of the march. Two weeks you want to come hike up with me to the base camp of Mount Everest, I’m actually making a full attempt of Mount Everest this year. I’m hoping to get onto the summit and that’s a project I’ve been working on for over a year now. So this is the year for me, 2019. Some people, some of my clients, they said they want to come with me, they’ll base camp. I thought, “Why don’t we put together an event and date, bring everyone with us so we’re going to have a good party at the base camp and then I take off from there. Srini Saripalli: That’s the idea, that’s happening towards the end of the month, end of March. If that is of interest to you, go to summitnumbertwosuccess.com. That’s the website where you can go get all the details about the expedition to Everest base camp. Okay, 408 912 5038 is the number in the studio, and I will get your name into the draw. By the way, the draw is for the Success 2019, the one day event that’s happening on March 9th. If that is of interest to you, you’re welcome to call in into the studio. If there are no calls at all, then it means everybody gets a ticket? No. Aaron is laughing. No. Okay, no. So you have to call in to put your name. The first caller, whoever calls in implicitly wins because they are the only caller into the show. Okay. Srini Saripalli: The other question I want to share with you. I’m getting these questions, “What would you tell someone who is starting out with this new intention of making this year the best and they have some resolutions, they have some stuff going on the mind? Regardless of the profession, regardless of the personal state, what are your suggestions?” I have a seven or six of these I want to quickly go by. Let’s see, if somebody is calling in then we’ll go with that. I’ll your calls anyway but then I’m going to this quickly. Srini Saripalli: Number one is mindset, very important regardless. So if you simply shifted the mindset and doing what you do today, regardless of changing any skill, any capabilities, any of those things. You just shift your mindset, that’s it. Results [inaudible 00:17:09]. You’ll see improvements. You have callers coming in? Okay, thank you. Hey, thanks for calling in. What’s your name? Listener: Hey Srini, my name is Venkat. Srini Saripalli: Venkat, where are you are calling from? Srini Saripalli: Venkat, you are the implicit winner now? Srini Saripalli: Oh yeah, absolutely [inaudible 00:17:26]. Listener: I wanted to say I enjoy your show, and I wanted to thank you. Listener: Definitely you provide lot of valuable information. Srini Saripalli: Thank you. Appreciate you Venkat. Oh, by the way, what’s one of the reasons why you want to come to Success 2019? Listener: I wanted to explore basically what are your offering and all. I’ve been listening to you recently. Actually, I heard about you from other friends and they gave good feedback. I was wondering if I can come and explore it. Srini Saripalli: Okay, so Venkat for now you are the winner. A bit of a second call and we don’t know, but then I want you to come to the event, okay? Srini Saripalli: Let’s stay tuned. Thank you, I appreciate it. Srini Saripalli: Thank you, appreciate it. 408 912 5038 is the number in the studio. We have Venkat who called in, so if you don’t want to Venkat to win please call in. Okay, now that’s a joke. If you want to win, everybody’s a winner. If you want to participate, you want to come, you want to show up at Success 2019, you’re welcome. 408 912 5038 is the number. Aaron is raising his hand, and telling me, “Srini, we have only five minutes to wrap this up.” First is mindset, shift your mindset, the game changes. Now how do you shift the mindset? That’s a whole different story. I don’t have the time to go into all the details and give you all the information, but that’s one. Srini Saripalli: Nick, where are you calling from, Nick? Listener: I’m calling from California. Srini Saripalli: Okay, no, just give me your city please. Listener: My name is [inaudible 00:19:22]. Srini Saripalli: [inaudible 00:19:23] Thank you for calling in. Which city are you calling from? Srini Saripalli: San Jose, I got your name [inaudible 00:19:29]. Thank you. Appreciate it. Thanks for calling. Let’s go to the next caller. “Hey, thank you for calling in, your name? Listener: My name is Ranee. Srini Saripalli: Ranee, thank you and which city are you calling from? Listener: I’m calling from Fremont California. Srini Saripalli: Fremont, California. Thank you. Appreciate it. Your name is in. Let me go to the next caller. Thank you for calling in. Your name please. Hello? Srini Saripalli: Hello. Yes sir. Your my name? Listener: My name is [inaudible 00:19:52]. Srini Saripalli: [inaudible 00:19:54] thank you. Where are you calling from [inaudible 00:19:58]? Listener: I’m calling from [inaudible 00:20:00]. Srini Saripalli: [inaudible 00:20:01] thank you. I got your name and I have a few callers. Let me take the call, I’m short on time. Hey this is Srini, thanks for calling in your name? Srini Saripalli: [inaudible 00:20:12] Thank you. Listener: Okay, [inaudible 00:20:15]. Thank you, where are you calling from? Srini Saripalli: Thank you. I got your name. Excellent. Thank you very much. Hey this is Srini, thanks for calling in your name? Listener: [inaudible 00:20:25] My call was [inaudible 00:20:28]. Srini Saripalli: Okay, you’re not from Panama San Jose, are you? Srini Saripalli: Okay, I got your name in Panama, excellent. Question for you, what is the one thing that you’re seeking at Success 2019 if you’re coming? Listener: I was actually thinking for my teenager. Srini Saripalli: Excellent, very good. Srini Saripalli: How old is your teenager? Srini Saripalli: 15, okay. Yes I would say bring your kids. Certainly your husband for sure. Definitely your children will benefit. 15, is good age. Yes, absolutely. Okay. Specifically do I have anything for them in the room? Maybe I will, I’m not sure yet, but we will see. We’ll figure that one out, but they will be motivated for sure if they’re coming. Okay? Srini Saripalli: Thank you, I appreciate your call. Srini Saripalli: [inaudible 00:21:45] that’s a good one. I thought I missed it otherwise. We have one minute, we can take one more call? Okay, thank you for calling, your name please? Srini Saripalli: [inaudible 00:22:00] Thank you, which place are you calling from, from which city? Srini Saripalli: Union, thank you. [inaudible 00:22:08] anything specifically that you’re seeking at the event? Listener: Yeah, I want to explore what you’re offering as the earlier called who called in. I would definitely try to come to the base camp on Mount Everest. Srini Saripalli: Okay, absolutely. If you’re waiting to decide on that till on March 9th, I think it will be late. But then you’re welcome to go www.summit2success.com and send me an email info@positivepositioning.com I will give you all the details. Srini Saripalli: I have one caller. I will take the call. Thanks for calling in, your name please? Listener: I’m Chintan from [inaudible 00:22:41]. Srini Saripalli: Chintan thank you. Are you the came Chintan my old friend? Srini Saripalli: No. Okay, sorry. , you’re a friend of mine by the way regardless, okay. Thank you. I’m done, I think we’re done. We have 30 seconds quickly Aaron got through those numbers and do the draw. Rani from Fremont you’re the winner for Success 2019, send an email at info@positivepositioning.com and I’ll get you all the details, how you can show up at the event. You have two tickets to come to the event. My time is up guys, thank you for everything. Thank you for tuning in, info@positivepositioning.com is my email. You have a great Saturday and this weekend, bye now.